Here is a sampling of anchorages, many of which qualify as gunkholes. Please Note: Conditions on the Chesapeake Bay can change rapidly. Skippers should consult professional cruising guides and charts and always use their own good judgment when sailing. It's like driving right into a cultural center and getting the room with the best view. Compact friendly harborfront offers diversity of high quality shore activities: restaurants, museums, theaters, aquarium, and entertainment. Better to use marinas than anchoring because of boat traffic and convenience of access to the city. Cottages and suburbia, moderately developed. Open enough to provide some relief on hot summer evenings. Just north of Sillery Bay, in the Magothy River . Well protected. Good anchorage. Less than an hour to Chesapeake Bay . Wide open pastoral setting. Nice anchorage in calm weather. Beautiful spot. Site of the Russian embassy's dacha (once owned by magnate John Jacob Raskob) and rumored to be the scene of hot espionage plots during the Cold War. Many good anchorages above Town, Wash and Rocky Points. Better protection than Cacaway Island and less populated. Near a marina. Entrance to the Creek is tricky; follow the charts as the channel comes in close to shore. Lots of entertainment with boats going aground if they do not follow the markers. Good anchorage. Protected and pretty. Sometimes noisy from the nearby Mears Great Oak Landing hotel and marina, but fun to visit as well. Havre de Grace Directly across from the entrance to the C&D Canal Good staging area for a transit through the C&D canal. Nice town with quaint B&Bs, antique shops and restaurants. Tidewater Marina excels. 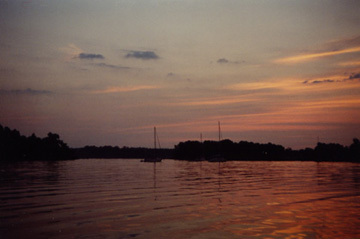 First hospitable anchorage on the Chester River , north of Kent Narrows . Well protected and pretty. Easy to get to from the Upper and Middle Bay . Moderately tricky entrance. Deserted, large anchorage. Well protected. Charming town with shops, restaurants, and marinas. Several excellent restaurants nearby, offering seafood directly from the fishing boats that make this their home. The water route to Georgetown , MD, home of the Granary Restaurant. Distant from the Middle Bay . Good anchorage up the river a ways at Turner Creek. Different topography in that the banks are higher than most tributaries here. Kitty Knight House historically interesting and in a beautiful spot. Quiet achorage (no facilities) with good holding in the outer waters but minimum room inside and very shallow water. Voted "Best of the Bay" by Chesapeake Bay Magazine readers. This anchorage is not good when wind is strong from the West or Northwest. Easy to get to consequently often crowded in temperate months. Close to Gratitude and Rock Hall and the restaurants there. Room enough in outer waters but long fetch to West and Northwest. Inner waters offer little room and crowded, but a well-regarded restaurant (Harbor House) nearby at the Worton Creek Marina. Decent enough anchorage, with room but shallow water. Scenery is suburban mediocre. Just down-stream from Granary Creek, off the Wye East River. Idyllic setting with the best crabbing you'll ever experience. Totally unspoiled, and if you get there mid-week, you might just be lucky enough to find solitude. One of our favorites. In the Magothy, just south of Cornfield Creek and to the northeast of Gibson Island . Protected. Good sized- anchorage. Mostly wooded. Little traffic. High-toned traffic from Gibson Island the primary distraction. Off Harris Creek which is off the Choptank River . Everyman's anchorage, according to Elliott Alterman. Overpopulated on weekends. Been there many, many times, and still keep going back. Off the Wye East River . Just as nice as Dividing Creek. Also well protected. Off the Choptank River . Just south of the Tred Avon River and Oxford , MD. Seldom visited. Idyllic. Charts show the entrance shallow (MLW) but it is well marked. Suburbia. High traffic. Within listening distance of Annapolis. Bight east of Caulk Cove superb. Great anchorage. Good anchorage. No traffic, though some development. Easier to enter than chart suggests. Beats the crowds at Oxford , with better holding than Town Creek . A legend for its beauty and fine cruising. Protected and snug. Semi-wilderness even though near high civilization. Up the South River on the north shore. Too open to be a suitable anchorage in its own right but two coves are terrific, Dun Cove and Waterhole Cove, the latter being open to easterlies. Upper Miles River , past St. Michaels. Great anchorage. Wild. Well protected. Beautiful. No traffic. Tough to enter, but nice anchorage once in. Favor starboard side going in. 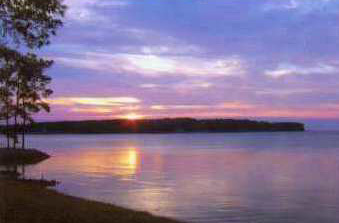 A large enough hide-away for those who eat in St. Michaels but seek greater peace across the Miles River . The first left when entering La Trappe Creek, off the Choptank River . Good anchorage. Well protected. Minimal development on shore. Good anchorage - a legend for its beauty and fine cruising. Long & narrow. Beats the crowds at Oxford , with better holding than Town Creek. Best early or late in season because of crowds that raft up there mid- season. Pretty. Convenient for Middle Bay sailors. Just north of Annapolis , up from Whitehall Bay and into Whitehall Creek to the second creek. While well developed, still pretty because it is forested. Watch for down-stream shoal when entering Rideout. San Domingo Creek Off Broad Creek on the Choptank River The "back door" to St. Michael's, allows visitors to get there from Oxford without going "all the way around" to the Miles River. Anchor as far up as you dare, then dinghy to the top of the creek and walk right into town. Secure your dinghy well! 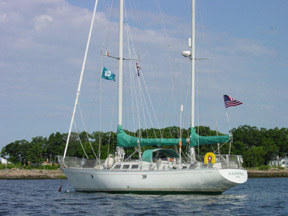 Often favored as an anchorage, offering broad water expanse. Good holding. But open to north and northwest weather. Excellent for catching a breeze on a hot day. Lots of raft-ups mid-summer. A honey of an anchorage. Well protected. Normally not too crowded. Good holding. Use caution when entering the narrow but well-marked channel. Away from the crowds at St. Michael's but too far to reach town. Lots of anchorage. Well protected and scenic. Good holding. Some traffic. Lots of crab pots at mouth. Galesville anchorage affords access to several restaurants. Notable anchorages are The Glebe and King's Cote . Numerous crab pots in the Coan. Well-protected. Tricky entrance. Tight. Beautiful cove. Good restaurant a dinghy ride away. A beautiful spot. Was only there once a long time ago but it was memorable. Pristine. Good holding. Lots of anchorages. Lovely. Above Point Patience, left-hand side, near Cockhold Creek. Slightly developed. Attractive. Mill Creek is the south split of the creek; Cockhold, the north. Listen to the radio traffic between the subs and surface vessels on the Patuxent. High scenery. Many anchorages. Once of the choice spots on the Western shore. Several anchorages, including Jutland Creek, especially Fox Harbor (good holding, well protected & largely undeveloped). Good anchorages at several creeks, including Carthagena and St. Inigos, and Horseshoe Bend. The town of St. Mary's is historically interesting and well worth a visit. First major starboard turnoff up the Creek. Good holding. Reasonably well protected. Pleasant homes. (Note: Solomon's Island is a big destination for cruiser's rallys). Palmer Cove. Wild. Pretty. Good holding ground. North branch. Great seafood market. Some decent holding, but near the Menhaden plants and their odor. Northwest branch of the river extended. Huge anchorage, the size of Shaw Bay or better. Exposed to the north.